I have a tendency to want to design"girly" digital paper for my blog. I have always been somewhat of a tomboy, but now that I am surrounded by guys I really enjoy creating pretty things . But I also love blue and airplanes, so I designed this fun "biplane" themed paper pack to share with you today. This would be a great paper set to use on storyboards or greeting cards and works for boys or girls. I found the biplane images on Pixabay and I used Topaz Impression to turn them into painted art. Like all of my digital papers, you can use these designs in your personal or commercial work, no attribution necessary. I would love to see your creations on my Facebook page. 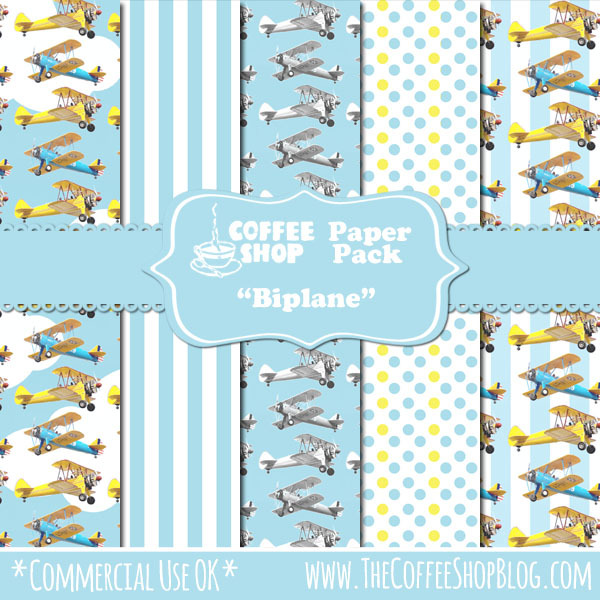 Download the free CoffeeShop"Biplane" Digital Paper Pack. You can also download it here. Rita....as always your biplane digital paper pack is terrific. Great biplane you found. Thanks for the set and thanks for introducing me to Pixabay. I've found so many incredible pics over there.